The historical Johnny Ringo was an Arizona gunman associated with Ike Clanton, Curly Bill Brocius and the outlaws known as the Cowboys around 1880 in Cochise County. He may have been the most feared gunman among them, but that’s not clear. He was found dead in a remote spot with a bullet in his head in 1882 at the age of 32, and nobody knows how he got the bullet or who put it there. Since he often shows up as a character in movies about Wyatt Earp in Tombstone, some have been tempted to show Wyatt or Doc Holliday as the responsible party. 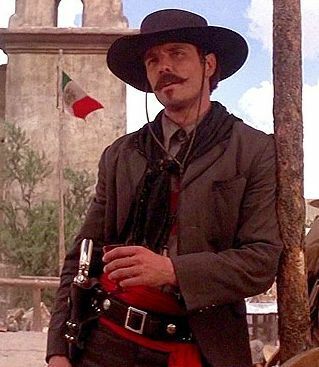 (See Michael Biehn’s death in Tombstone, for example—Biehn gives what is probably the best representation on film of the historical Ringo, although he is embellished somewhat.) But nobody really knows the circumstances of Ringo’s death. The coroner ruled that he died by suicide. His reputation may have been exaggerated, but he had a great name for a gunman. For historical background on the real Johnny Ringo, the definitive biography so far is probably Jack Burrows’ Johnny Ringo: The Gunfighter Who Never Was (1987). The Ringo KId (John Wayne) stops the stage in Stagecoach (1939). 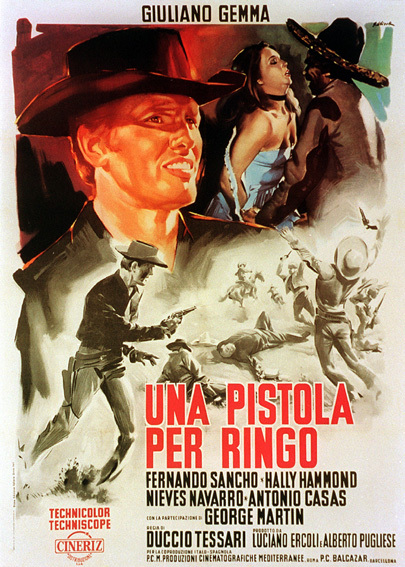 The name Ringo itself, like “Cimarron,” is redolent of the legends of the American west, and it has been used many times in fictional situations. 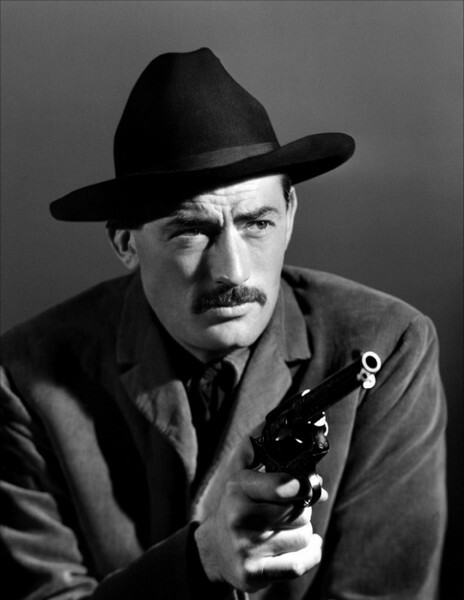 The best known are the Ringo Kid, played by John Wayne in Stagecoach (1939), and Jimmy Ringo, an aging gunfighter played by Gregory Peck in The Gunfighter (1950), both sympathetic characters. 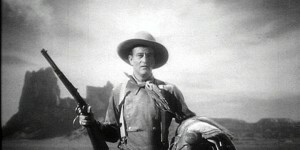 The Ringo Kid (John Wayne) has just broken out of the territorial prison, but he was there for a crime he didn’t commit and most people except the Plummer brothers seem to like him. 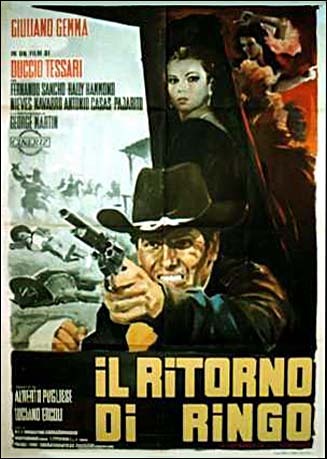 Jimmy Ringo (Gregory Peck) has led a life of violence, which apparently causes him to draw challengers like flies, but now he wants to leave that life behind and reconcile with his estranged wife, making a family life with a son who doesn’t know him. Several makers of spaghetti westerns were fond of the name Ringo, too. 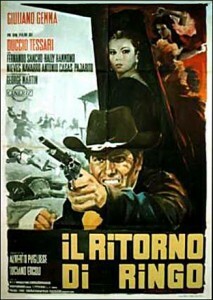 Giuliano Gemma seemed to be the most frequent, or at least the best-known, Italian Ringo. It just seems like a good, all-purpose name for a gunman or an outlaw. Variations on it (Django, Rango) crop up in a variety of western films. You never see it applied to a lawman, though. Above: Gregory Peck as aging gunfighter Jimmy Ringo in The Gunfighter (1950); the studio hated Peck’s moustache and thought that it was why the movie didn’t do well at the box office, although the film is now regarded as a near-classic. And Michael Biehn as Johnny Ringo in Tombstone (1993), perhaps the best depiction on film of the actual Arizona gunman. An educated man, he quotes the Bible and Latin aphorisms with seeming facility, although the real Johnny Ringo was unlikely to have had such an education. This entry was posted in Lists and tagged Outlaw Gangs, Wyatt Earp on November 19, 2014 by Nicholas Chennault.